It is already common knowledge that individual investors do not usually have the necessary resources and abilities to properly research an investment opportunity. As a result, most investors pick their illusory “winners” by making a superficial analysis and research that leads to poor performance on aggregate. Since stock returns aren’t usually symmetrically distributed and index returns are more affected by a few outlier stocks (i.e. the FAANG stocks dominating and driving S&P 500 Index’s returns in recent years), more than 50% of the constituents of the Standard and Poor’s 500 Index underperform the benchmark. Hence, if you randomly pick a stock, there is more than 50% chance that you’d fail to beat the market. At the same time, the 15 most favored S&P 500 stocks by the hedge funds monitored by Insider Monkey generated a return of 19.7% during the first 2.5 months of 2019 (vs. 13.1% gain for SPY), with 93% of these stocks outperforming the benchmark. Of course, hedge funds do make wrong bets on some occasions and these get disproportionately publicized on financial media, but piggybacking their moves can beat the broader market on average. That’s why we are going to go over recent hedge fund activity in VMware, Inc. (NYSE:VMW). VMware, Inc. (NYSE:VMW) was in 32 hedge funds’ portfolios at the end of the fourth quarter of 2018. VMW has experienced a decrease in enthusiasm from smart money of late. There were 38 hedge funds in our database with VMW holdings at the end of the previous quarter. Our calculations also showed that VMW isn’t among the 30 most popular stocks among hedge funds. Let’s take a peek at the new hedge fund action surrounding VMware, Inc. (NYSE:VMW). How are hedge funds trading VMware, Inc. (NYSE:VMW)? 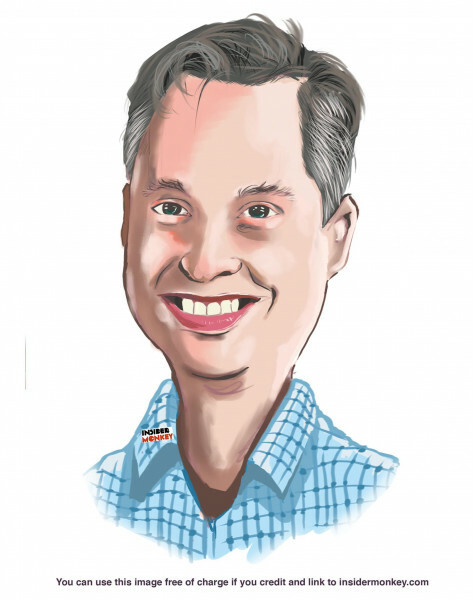 Heading into the first quarter of 2019, a total of 32 of the hedge funds tracked by Insider Monkey were bullish on this stock, a change of -16% from one quarter earlier. 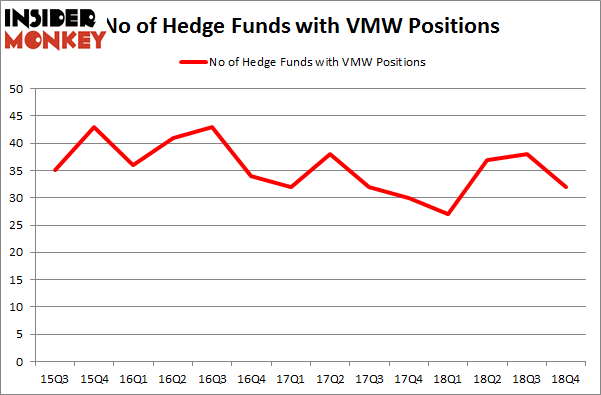 The graph below displays the number of hedge funds with bullish position in VMW over the last 14 quarters. With hedge funds’ positions undergoing their usual ebb and flow, there exists a few key hedge fund managers who were upping their holdings meaningfully (or already accumulated large positions). Among these funds, Renaissance Technologies held the most valuable stake in VMware, Inc. (NYSE:VMW), which was worth $690.2 million at the end of the third quarter. On the second spot was D E Shaw which amassed $286.3 million worth of shares. Moreover, Jericho Capital Asset Management, Citadel Investment Group, and Two Sigma Advisors were also bullish on VMware, Inc. (NYSE:VMW), allocating a large percentage of their portfolios to this stock. Judging by the fact that VMware, Inc. (NYSE:VMW) has witnessed falling interest from the smart money, it’s easy to see that there exists a select few money managers that slashed their full holdings last quarter. It’s worth mentioning that Kenneth Mario Garschina’s Mason Capital Management cut the largest investment of the “upper crust” of funds watched by Insider Monkey, valued at about $156.1 million in stock. Paul Singer’s fund, Elliott Management, also cut its stock, about $83.6 million worth. These moves are interesting, as aggregate hedge fund interest was cut by 6 funds last quarter. Let’s now take a look at hedge fund activity in other stocks similar to VMware, Inc. (NYSE:VMW). We will take a look at Charles Schwab Corp (NYSE:SCHW), Baidu.com, Inc. (NASDAQ:BIDU), The TJX Companies, Inc. (NYSE:TJX), and Intuitive Surgical, Inc. (NASDAQ:ISRG). This group of stocks’ market valuations are similar to VMW’s market valuation. As you can see these stocks had an average of 51 hedge funds with bullish positions and the average amount invested in these stocks was $2651 million. That figure was $1806 million in VMW’s case. The TJX Companies, Inc. (NYSE:TJX) is the most popular stock in this table. On the other hand Charles Schwab Corp (NYSE:SCHW) is the least popular one with only 46 bullish hedge fund positions. Compared to these stocks VMware, Inc. (NYSE:VMW) is even less popular than SCHW. Considering that hedge funds aren’t fond of this stock in relation to other companies analyzed in this article, it may be a good idea to analyze it in detail and understand why the smart money isn’t behind this stock. This isn’t necessarily bad news. Although it is possible that hedge funds may think the stock is overpriced and view the stock as a short candidate, they may not be very familiar with the bullish thesis. Our calculations showed that top 15 most popular stocks among hedge funds returned 19.7% through March 15th and outperformed the S&P 500 ETF (SPY) by 6.6 percentage points. Hedge funds were also right about betting on VMW as the stock returned 32.4% and outperformed the market as well.